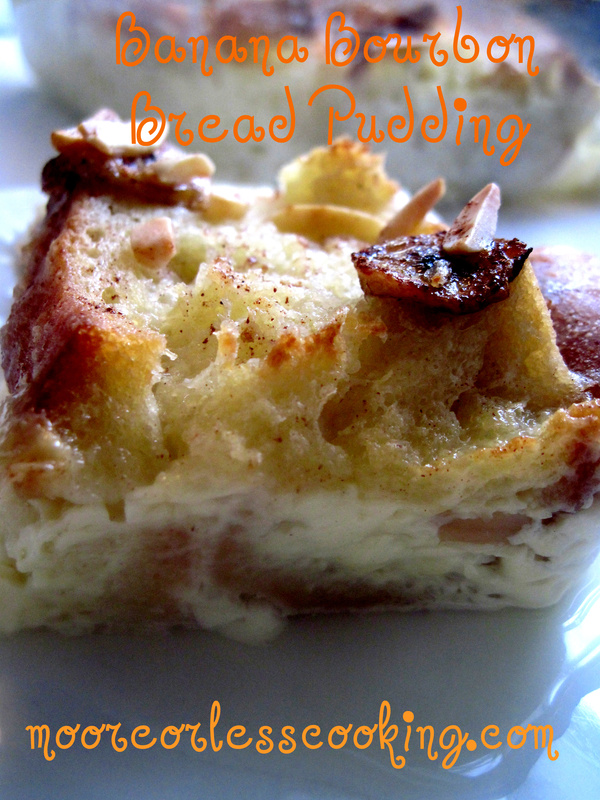 I have a weakness for bread pudding. I always steered clear from making it thinking it was some elaborate dish that I could not handle. Also, if it were too easy to make, I would be making it all of the time, plus not having the will power to step away from a large spoon and devour the whole bread pudding casserole in one fair swoop. On this Sunday’s Joy The Baker’s dessert menu recipe is Bourbon Bread Pudding. I have made Banana Bread so many times, I have lost count. Very amazing with Ghiradelli Dark Chocolate and Macadamia Nuts. So I thought I would make a bread pudding. Baker Dave delivered an amazing Boule, it was perfect for the bread pudding with the right texture. Spread a generous amount of butter on one side of each slice of bread and line the bottom and sides of the baking dish. Insert slices of banana between each slice of bread. Mix together the milk, eggs, Bourbon, sugar, salt, raisins, and vanilla and cinnamon, if you are using them, and pour over the bread. Place any extra pieces of bread on top and press down so they are submerged. Sprinkle with almonds. Let stand for about 10 minutes, a little longer if the bread is particularly dry. Bake covered for 30 minutes, then uncover and bake for 30 minutes more. If you like a crustier brown top, slip the dish under a hot broiler a few minutes until deep golden. Bread pudding makes me think of home, warmth and family. And we sure don’t eat enough of it. Thanks so much for the thought and I think I will make the family some nice bread pudding for dessert tonight and warm them up.